Paris is currently experiencing one of the worst terrorist attacks in modern history. Multiple shootings and explosions have left at least 60 people dead, according to some reports. It comes less than a year after an attack on the satirical French newspaper Charlie Hebdo left 12 dead. As the situation continues to unfold and officials determine the identities and motives of the attackers, it's worthwhile to examine France's gun control. If we've learned anything from Charlie Hebdo, it's that even though France's gun laws are strict, they wouldn't have stopped the latest Paris attacks. Update: French police confirmed a total of six attacks in Paris, including two suicide attacks and one bombing near the Stade de France, as well as attacks at the Bataclan concert hall and a restaurant. French news outlets reported that police launched an assault on the Bataclan concert hall, where gunmen were holding 100 hostages. According to The Guardian, eight attackers are dead, several after detonating suicide belts. Authorities have reported that the number of fatalities has reached at least 120. 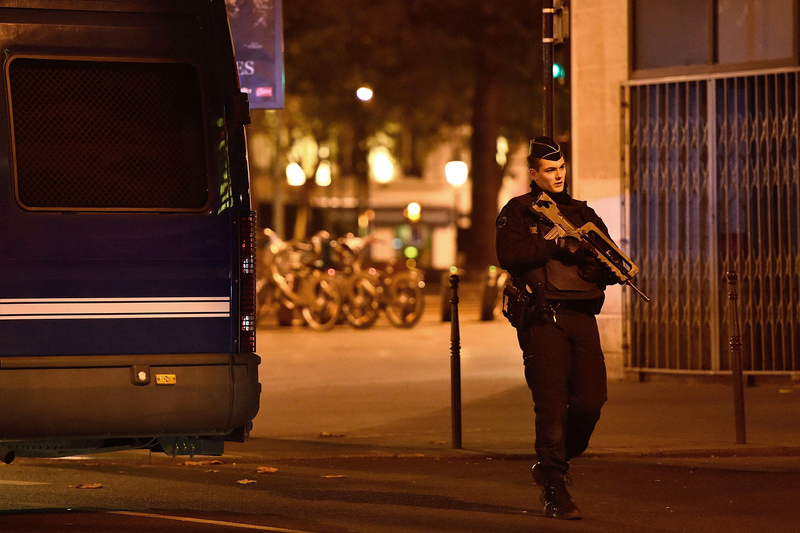 ISIS has claimed responsibility for the attacks; President Hollande agrees it was the terror group. Earlier: According to the University of Sydney's Gun Policy website, gun control in France is categorized as "restrictive." Keep in mind that, unlike in the U.S., France does not have a "right to bear arms" — the right to privately own a gun is not protected by law. In order to purchase a firearm, one must first obtain a hunting or shooting sport license, which requires a psychological evaluation and regular renewal. Semi-automatic rifles that can hold more than three rounds, as well as rifles and handguns with military-grade calibers, require permits. Fully automatic weapons are completely illegal for civilians. If one purchases or possesses a gun illegally, the punishment is a maximum of seven years in prison, plus a fine. So does that mean the attackers who carried out the Friday the 13th attack obtained such licenses? The answer is almost certainly no. Several reports have claimed that the attackers were using Kalashnikov rifles, which are the same kind of automatic weapon used by the shooters in the Charlie Hebdo attack. Experts have theorized that the Charlie Hebdo attackers obtained their Kalashnikovs illegally through the black market, and that the weapons had been smuggled in from Eastern Europe. A Washington Post article from last January estimates that there are now twice as many illegal guns as there legal ones in France. So more likely than not, the perpetrators in Friday's attack obtained their weapons in a similar manner. Therefore, the restrictiveness of a country's gun laws is a moot point when criminals and terrorists act outside of the legal boundaries — which can be said for not only the attackers, but for everyone involved in the illegal arms trade and manufacturing. After the Charlie Hebdo attack, many (particularly conservatives) questioned whether less restrictive gun laws would have allowed for armed civilian intervention. While it's certainly possible, there are no guarantees, and it's not likely a civilian with a handgun could overtake several gunmen with AK-47 assault rifles. The real issue, it seems, lies in cracking down on illegal gun trafficking, not gun laws for private owners.